Empty — no template is used for the project. VR — a template is used to facilitate creation of a custom application for VR. 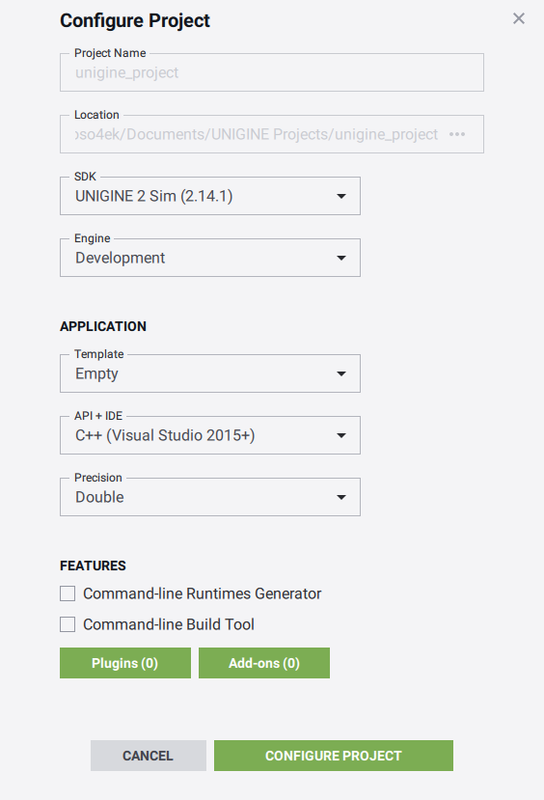 IG — a template is used to facilitate creation of a custom Image Generator application. 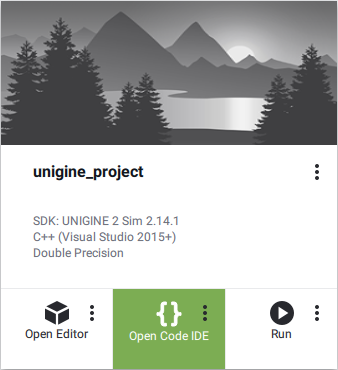 UnigineScript only — UnigineScript will be used to implement the project. C++ (Qt-based) — Qt Creator, QMake, or CMake is required for building the project. App* plugins (AppProjection, AppSurround, AppWall, AppPanorama, and others) cannot be used in Qt-based and SDL-based applications. C# — C# API will be used to implement the project. 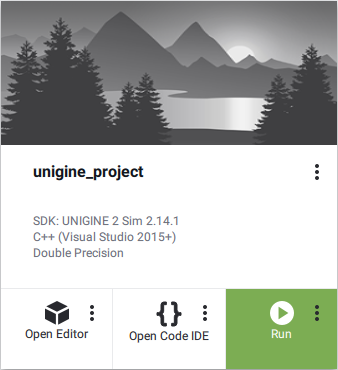 The Visual Studio will be used to compile a project. 32 bit — create the 32-bit release version of the application (_x86 postfix of the binary executable). 64 bit — create the 64-bit release version of the application (_x64 postfix of the binary executable). 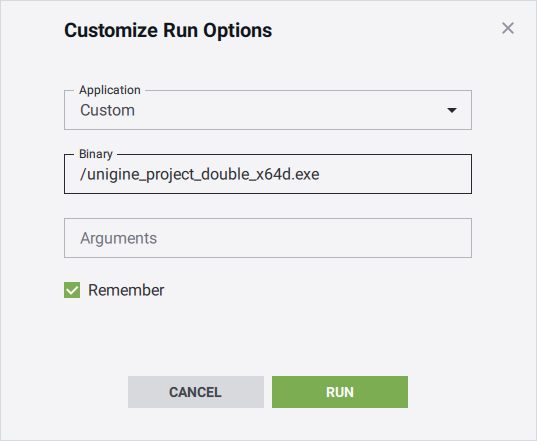 32 and 64 bits — create the both 32-bit and 64-bit release versions of the application. 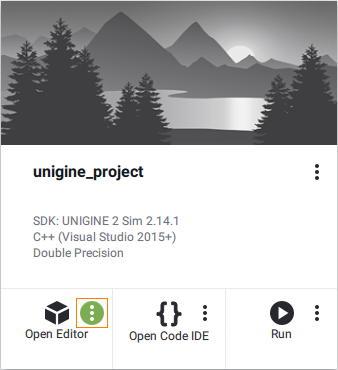 Create a project with the Component System. Create a project with the HLA Client plugin. 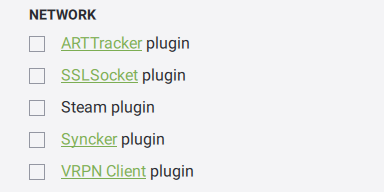 Create a project with the VRPN Client plugin. Create a project with the ARTTracker plugin. 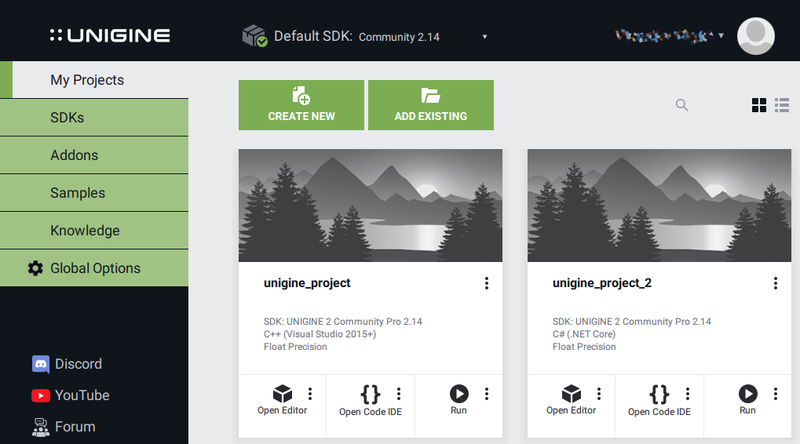 Create a project with the Kinect2 plugin. Enable GPU frequencies and temperature monitoring for your project. The project can be created including any add-on available in the Add-Ons tab. 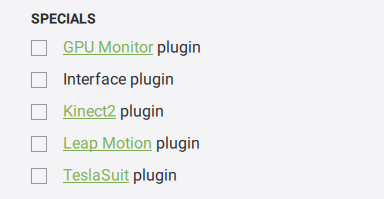 All required add-ons can be added both on and after project's creation. 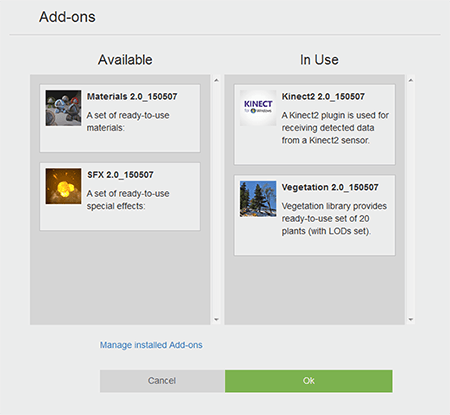 On the project creation, specify the add-ons to be included by clicking the Add-ons (0) button. Run the project without the loaded editor by clicking Run. 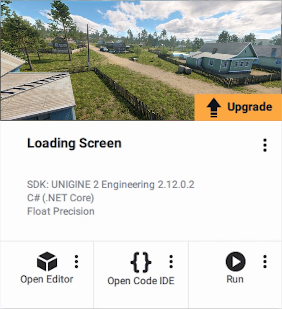 Clicking Edit Content will only launch the Editor, you will have to load the world manually: via the console, via the File -> Open World in the Menu Bar of the UnigineEditor, or by double-clicking the *.world file in the Asset Browser. 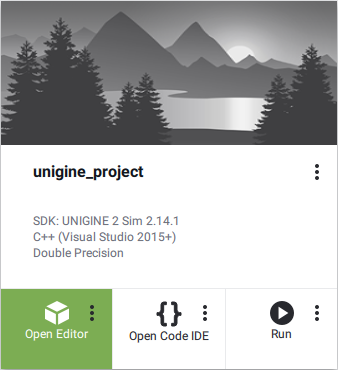 launch_debug — the launcher of the project's debug version. 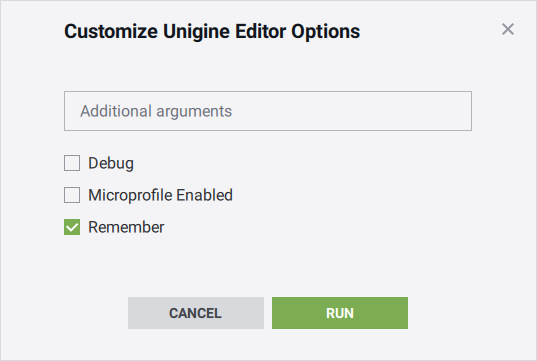 launch_editor — the launcher of the project's with the loaded editor. launch_release — the launcher of the project's release version. 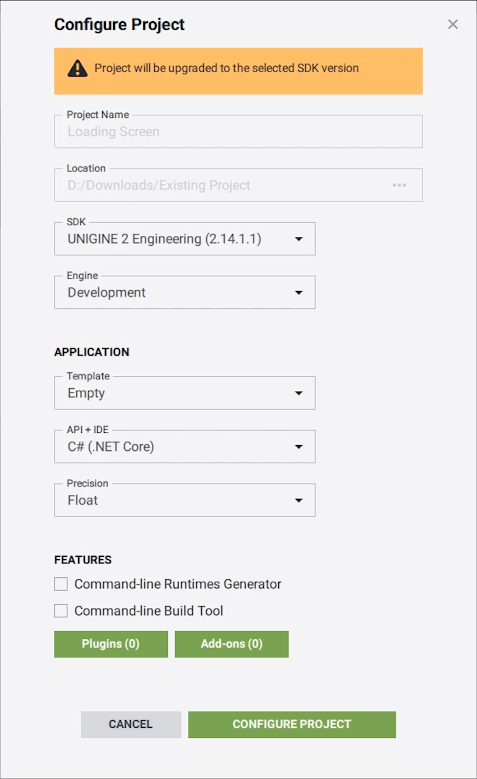 launcher — the startup file for the launcher that provides a GUI to configure application options and run the application. This launcher can be customized and used in the release version of your project. 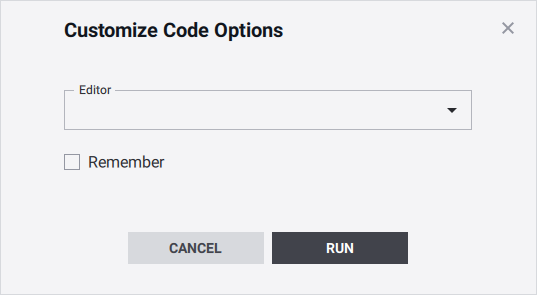 To create a project with the launcher, check the GUI-based settings configurator box in the project's creation window. 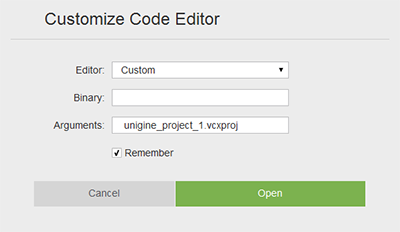 Via this form, the project without the loaded editor can be run with the custom settings. 32-bit — the 32-bit version of the main application. 64-bit — the 64-bit version of the main application. 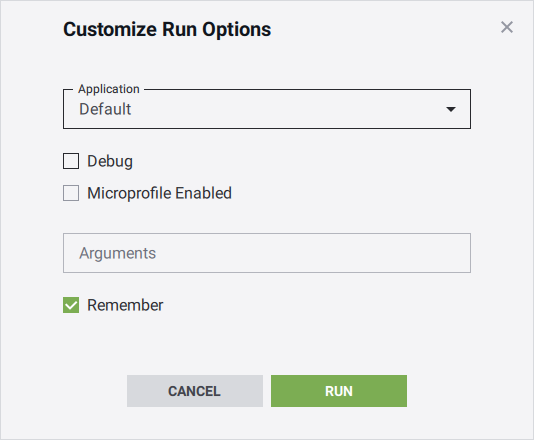 Indicates whether to remember the specified custom settings for a future run or not. Click Assemble project. The following form will open. *.meta files of such assets aren't included in the final build. Only a reference to the mounted folder shall be included in the final build, not its contents. If you exclude *.umount files, the referenced content won't be available in the final build, and the project will be invalid. 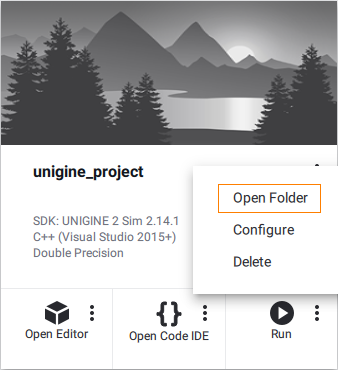 The source/ and bin/ folders, the *.project and *.cache files, and launchers are excluded from the final build by default. Types of files that should be compressed to reduce the hard drive memory usage. This won't influence the engine performance much. Use the wildcards patterns to include/exclude the required items. The maximum size of the archive is 2 GB. By default, files of the following types are compressed: *.h, *.cpp, *.ui, *.world, *.node, *.mat, *.meta. 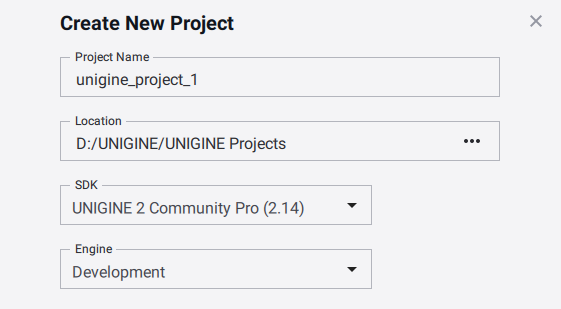 Via this form, you can change settings of an existing project: the UNIGINE Engine build used for the project, the version of the release application, the coordinates precision, and the general settings. 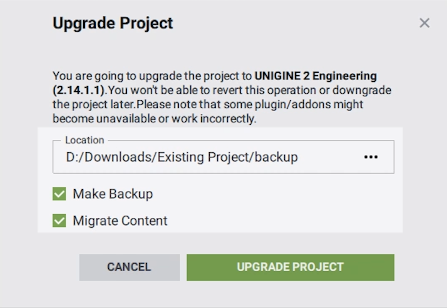 This option should also be used when you need to upgrade the existing project to the newest SDK version. If some of the files listed above are changed, the .modified postfix is added to names of such files. At that, the files from the SDK will also be copied.